Another dose of bad news for Liverpool was offset by some equally good news on Tuesday. On the same day it was announced that Reds defender Jamie Carragher would be out of action for as many as three months with a shoulder injury the team was given encouraging news regarding the impending return of captain Steven Gerrard and midfielder Joe Cole from their own injuries. Gerrard suffered a hamstring injury representing England in a Nov. 17 friendly versus France at Wembley Stadium and was subsequently rules for one month by team doctors at Anfield. Now the same sports medicine staff report that Gerrard has made sufficient progress on his ailment to return to training next week. The Liverpool icon is likely to make his return official when the Reds face Newcastle United one week from Saturday at St. James Park. Cole, who has failed to impress in his first season at Liverpool, has also been dealing with a hamstring problem. The former Chelsea and West Ham player’s burgeoning career was dealt a major blow by a series of injuries in recent years, but a move to Liverpool was supposed to be his chance to fulfill the great promise he has shown in the Premier League and in the England shirt. Instead he has struggled to stay on the pitch or contribute much while on it this season. Already back on the training ground, Cole is likely to play this Thursday in Liverpool’s Europa League clash with Steaua Bucharest. 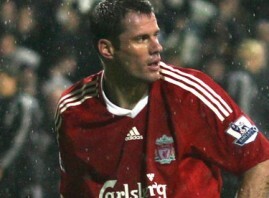 A fixture in the Reds back line for years, Carragher dislocated his shoulder in a 2-1 Premier League loss at Tottenham on Sunday. The injury requires surgery which will sideline the center back for approximately 12 weeks. Liverpool had already been playing without the services of center back Daniel Agger, who should return from a calf injury in the coming weeks. Following a dismal start to its 2010-11 Premier League campaign, Liverpool has righted the ship in recent weeks to move from the relegation zone to its current position 10th in the league table. On 19 points the Reds are within three points of 7th spot on the bright side and 16th if they stumble.